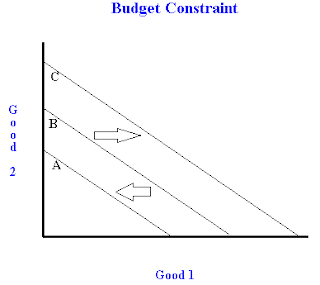 Budget constraint and welfare/tax breaks - FreeEconHelp.com, Learning Economics... Solved! Figuring out how government policy affects the budget constraint is very easy if you know how to relate the particular policy to either changes in income, or changes in prices. For a review on how income and price changes affect the budget constraint read this past post. When the government increases income taxes, people effectively have less disposable income. This will decrease the possible bundles able to be purchased by the consumer which means we will see a leftward shift in the budget line, or a shift from budget constraint B to budget constraint A. Similarly, if the government gives someone a welfare check (a transfer payment from the government) or decreases taxes in the form of a tax break, then the consumer’s income has effectively increased. This will result in a larger set of bundle consumption possibilities, or a rightward shift in the budget line, shifting from constraint B to budget constraint C.
It is also possible to tax or subsidize individual goods or services. Taxing a good will have the same effect as a price increase in the good would. A price/tax increase would decrease the amount of the good the consumer is able to buy so we would see a leftward rotation in the budget constraint, or the movement from budget constraint B to budget constraint A. If the government were to subsidize a good, for example milk and eggs, this would have the same effect as a price decrease. 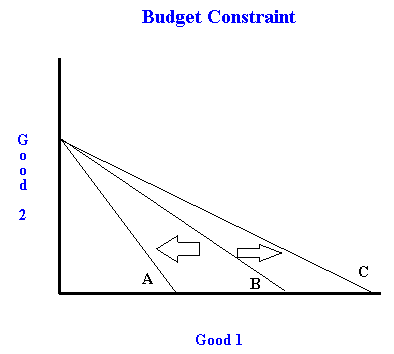 The consumer would be able to purchase more of this particular good, and the budget constraint would rotate right or change from budget constraint B to budget constraint C. Note that the intersection on the Y axis (good 2) has not changed because the price of good 2 has not changed, and neither has the income. 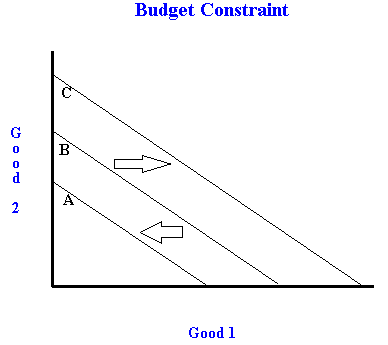 For an example of a budget constraint with indifferencecurve mappings when part of a good is given for free, check out these related posts.